Network Media, established in 2005, is proud to offer simple, effective marketing strategies and online solutions to small businesses in Steinbach and southeastern Manitoba. Serving hundreds of local customers, Network Media's proven marketing and deployment strategies are unmatched in the local trade area. 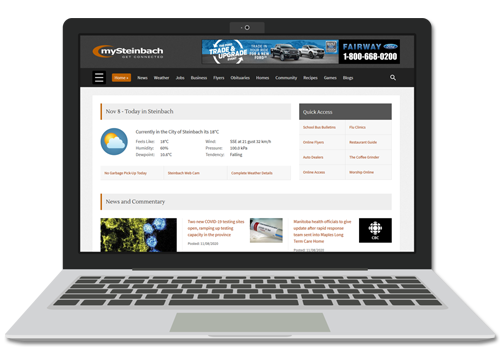 Network Media is the creator of mySteinbach.ca, Steinbach Manitoba's community web portal. This web portal offers local businesses affordable, effective online advertising in its extensive Business Directory and Job Market as well as traditional banner type advertising. What do you get in return for putting your trust in Network Media? A great product must be backed by a great support team. Network Media in Steinbach prides itself on providing outstanding customer service to all of our new and existing customers. Using Dedicated Servers, supported by a team of trained professionals, you can be sure that the products and services you purchase will not only be effective, but also reliable. Backed by decades of retail, sales and marketing experience, Network Media's duo of Brad Kehler and Corwyn Friesen are ready to point your business in the right direction. This website and all of its content are Copyright © 2019, Network Media.